This recipe is almost as easy as those not-so-great packets. To make this into a gift, mix together the dry ingredients (using coconut sugar as sweetener) for 4 or more servings and place in a jar. Add a bag of marshmallows and tie with a ribbon card that contains the Gift Instructions below. Stir together cocoa powder, coconut sugar, collagen and vanilla. Add a couple of tablespoons of heated milk to create a paste. Add remaining milk and stir until combined. Top with marshmallows. Stir 5 tbsp of mix together with ½ tsp vanilla extract. Add a couple of tablespoons of heated milk to create a paste. Add remaining milk and stir until combined. Top with as many marshmallows as you want! This recipe will not only rock your world but will rock your kids’ worlds and all those to whom you choose to bless with a DIY delicioso gift! These Paleo Marshmallows and Hot Chocolate are made from healthy, real food ingredients. I'm taking it one step further by making this all into a gift using my instructions. You, my friend, are going to love knowing you are feeding your family and friends something they not only WANT this time of year, but their bodies actually need. Don't believe me? Read on... Marshmallows are typically made from corn syrup, gelatin, sugar and assorted other ingredients (mostly unpronounceable). These marshmallows, however, are made with grass-fed gelatin and honey. The only other ingredients involved are water and something to roll them in if you choose to - tapioca starch for plain or cocoa powder, cinnamon or toasted coconut for flavored. 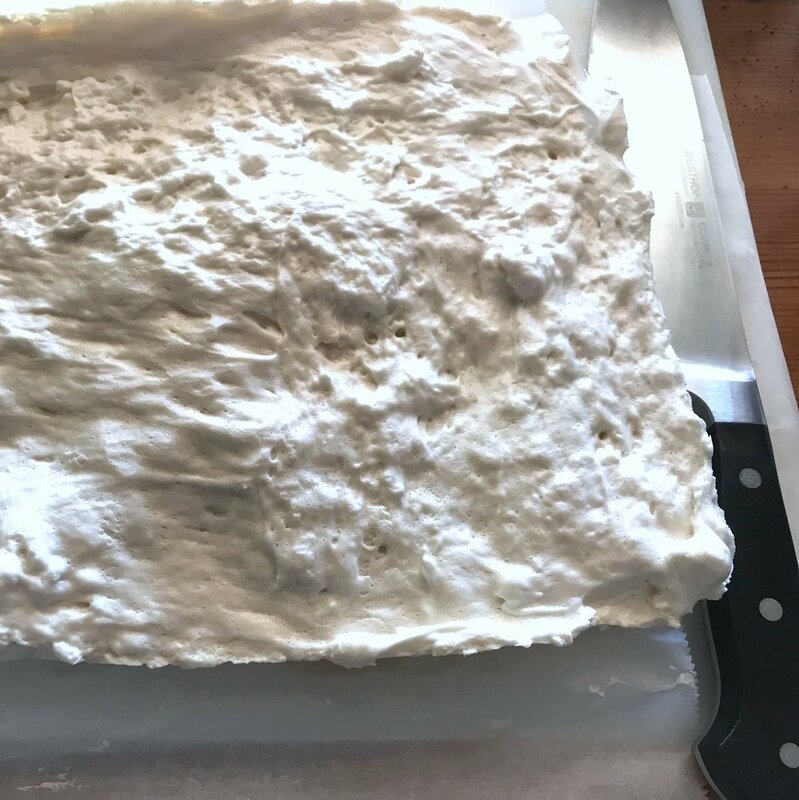 I took the marshmallow recipe directly from Katie at Wellness Mama so I’m going to just give you the link rather than reprinting (and if you don’t already follow her…you should just sign up now…great info!!) but I wanted to show you the steps in photos since it’s sort of like candy making and seeing it come together will definitely help you. She offers several other variations including making the probiotic marshmallows by add a few capsules of your favorite probiotics. The small change I made was rolling the finished marshmallows in tapioca flour to keep them from sticking together. It seems like a lot of steps. Most of them are the method for cutting marshmallows. One time making these and it will come naturally. Combine 1 cup honey with another ½ cup water in a medium saucepan. Let it come to a boil and boil continually for 8 minutes. If you have a candy thermometer this works much better since there is no guess work. You will be looking for 240 degrees. With your mixer running on low (or with a hand mixer in your non-dominant hand), slowly drizzle the honey mixture into the gelatin. (Photo is bad, but you can at least see the stream of honey going in…) When all of it has been added, increase speed to medium until the mixture is the consistency of thick cream. Increase speed to high and beat for about 15 minutes or until gentle peaks form. It will be the consistency of thick meringue. Add the vanilla (that’s the brown liquid in photo.) and beat again for a couple of seconds until incorporated. Spread into a parchment lined pan and smooth-ish (it will still be slightly puffy and not completely smooth on top) with a spatula. Let sit at room temperature for at least 4 hours before proceeding. Don’t get antsy and try to go on without waiting at least 4 hours…I did the first time with bad results! 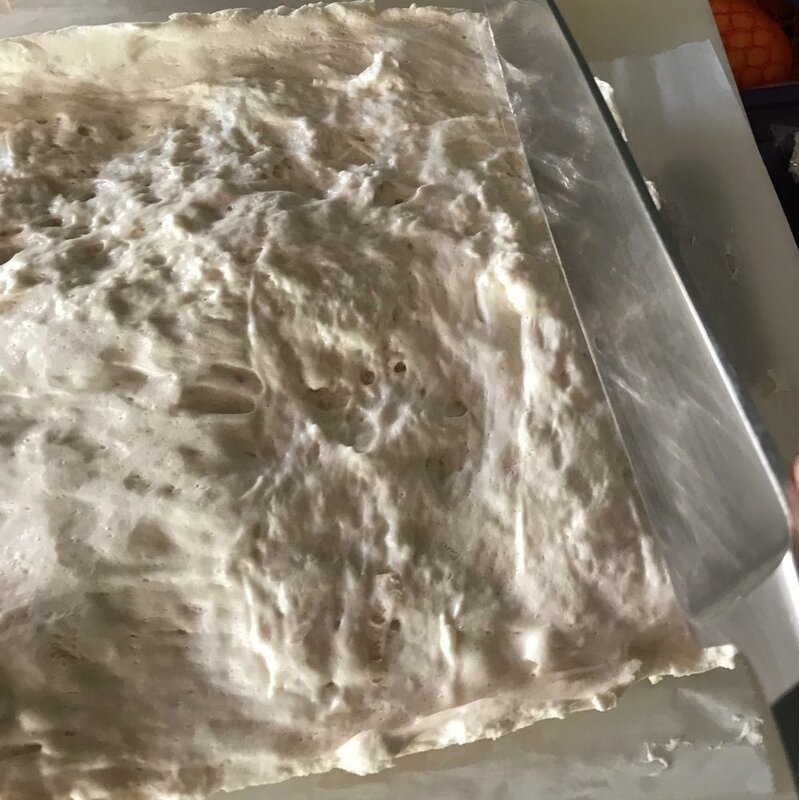 After they have sat for at least 4 hours, using the parchment paper, transfer to a cutting board to shape into marshmallows. Cut off ½” of all four sides and save to make mini marshmallows. Cut remaining slab into 1” strips and then cut the ½” edges into mini marshmallows. Set the minis aside until you get to Step Ten.